I have been traveling abroad for one month and two days now, and I have learned a lot about what I use on a daily basis. As a minimalist traveler, I had to choose carefully what I packed with me on this trip. After one full month I have realized that I keep reaching for the same six items over and over–so I wanted to share them with you! I knew that I was going to be traveling through airports and streets, and was aware of having my passport physically taken or lost. However, I was not aware of digital data that can be taken from passports as you travel. I decided to get the Travelambo RFID Blocking Passport Holder , and store my passport with all of my important IDs in it. Not only does this make it easier for me to keep track of my passport (I got it in purple, my favorite color and one that is easy to see in my bag), but it gives me peace of mind during my extended travel. It also makes it easier to go through security! I have definitely been in one of those travel situations where my phone is running low on battery and there are no charging stations available. This adds extra stress, especially if you are traveling somewhere you have never been before. I bought the PowerAdd Slim Portable Charger to use for my phone, and I can tell you that I have reached for it quite a few times after long travel days. Each full charge will give me an extra 8 hours of full phone use, which has saved me from many a stressful situation. On my second weekend we had a massive storm that cut the power where I was staying for a full day. I had charged up my portable battery in preparation, and am so glad that I did! I was able to let everyone know that I was safe, and to keep updated on conditions and use my phone flashlight. Many of you know that I own what I call my “keychain of life” aka a lanyard that has the most anyone has probably tried to put on a lanyard… and I knew that this would not be the ideal wallet to use while abroad. It had many items I did not need (cards for local stores, etc. ), and was bulky to carry around. I knew that I would be carrying three bags on my own, and have only one free hand. I decided to use this Eagle Creek Money Belt to store my cash and credit/debit cards under my clothes. This made it discreet, but also allowed me to easily access money without being worried about holding on to lots of items. It is also very comfortable for walking long distances or wearing for long periods of time (I have definitely tested this out), and sometimes I forget that I’m wearing it! I decided to leave my Nalgene water bottle at home for my travels, because one liter is simply too big to carry around consistently and with ease. However, sustainability and health are two of my primary concerns when it comes to minimalist travel so a reusable water bottle was a must. I opted for one that was easy to distinguish, and that holds half a liter of water. It is easy to clean, and has saved me lots of money at airports when I can pass on buying $6 disposable plastic water bottles. As someone who recognizes the importance of hydration as well, it has ensured that I stay healthy and minimize dehydration risks from long travel days and changing climates. Sustainability is something that I am very passionate about, and bamboo products are one of the best ways to manage your environmental impact while traveling. MABLE bamboo toothbrushes are self-standing and gentle on the gums, which makes them perfect for my sensitive teeth. They also have removable bristles so that you can reuse the handle for sustainable projects! (I think I am going to use mine as a label for an herb garden). For $10 they are more than worth the investment! You can read more about their initiative and goals here! Last–but not least–is a Dollar Shave Club razor. I joined back in May when I realized that I was paying way too much for a razor. As someone with dark hair, I shave quite often. I was intrigued by the idea of a razor subscription service, and decided to give it a go! Now I am someone who uses blades for longer than they probably should, but the Dollar Shave Club lets you change how often you receive replacements. As someone who cares about the environment but who knew that a safety razor would be hard to take traveling, this made perfect sense. The handle is durable and well-made, with detachable razor blade cartridges. It cost a grand total of $5 for me to get a razor and five blades, and I still have four of them left. I used to pay $10 for a good disposable razor that would last me a few months, but would have to throw the entire thing away and repurchase). Not only did I spend a lot of money, but I created a lot of trash. Now I have reduced my costs and my environmental impact! If you are interested in joining, click here! These are the six items that I find myself using almost every day, and ones that I know I will continue to use as I travel through Costa Rica and Serbia for the rest of the year. 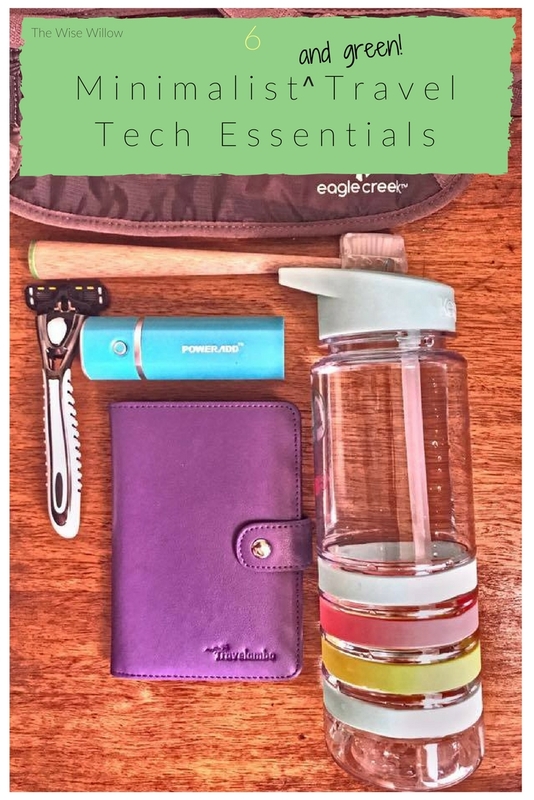 What are your minimalist travel tech essentials? ©2017 The Wise Willow and Alyssa DeBella. All rights reserved.